In a medium-sized bowl, whisk together the flour and the salt. Slowly add ice water a 1/2 cup at a time, stirring thoroughly after every addition, until a dough ball forms. I used a little less than 1 cup of water. Kneed on the counter top until a soft ball forms. Don't be afraid to use flour if it gets tacky. Let the dough rest for 20 minutes under a kitchen cloth. Resting the dough will prevent it from shrinking as you shape the dough in the next step. Roll the dough into a rectangle about a 1/2 cm thick. Divide your room temperature butter into thirds. Smear the first third of the butter on top of the dough. Fold it over on itself and pat it down. Then fold it again going the other way. Roll it out and repeat with the other thirds of butter. Wrap the dough with plastic wrap and chill it in the refrigerator to make the butter harder and easier to work with. When you finish your third fold, chill it in the refrigerator for 20 minutes. In the meantime we can make the custard. In a bowl whisk together egg yolks, sugar, and heavy cream. Slowly cook the custard over a double boiler, constantly stirring for 5 minutes until the custard heats through and it thickens. When you can draw a line through the custard on the back of a spoon and the line holds the custard is done. Set it aside to cool. Take the dough out of the fridge and lightly dust the dough and your rolling pin with flour. Roll it out to 1/4 cm thick. Working quickly so the butter doesn't melt, cut 1/2 inch strips of dough and wind the dough in a spiral to cover the entire inside. Press the dough with your fingers to make it smooth. Repeat with the remaining dough. You'll get about 16 tarts. 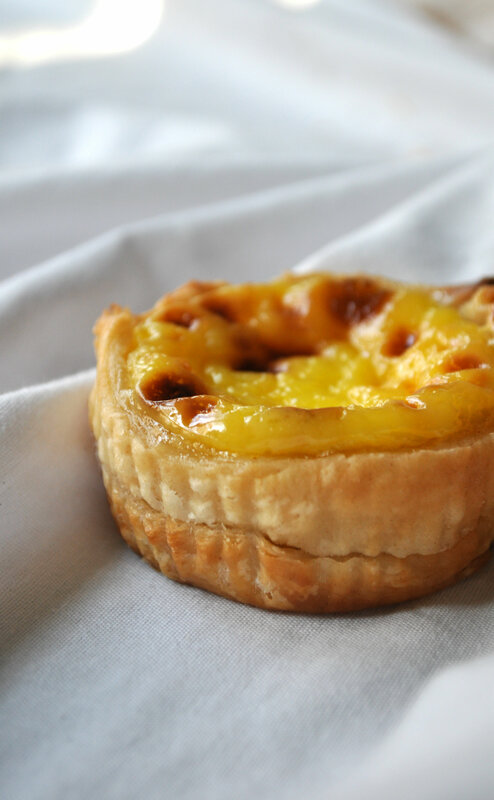 Fill the tarts with about a tablespoon of custard. Bake them for 20 minutes on the rack below the middle level. 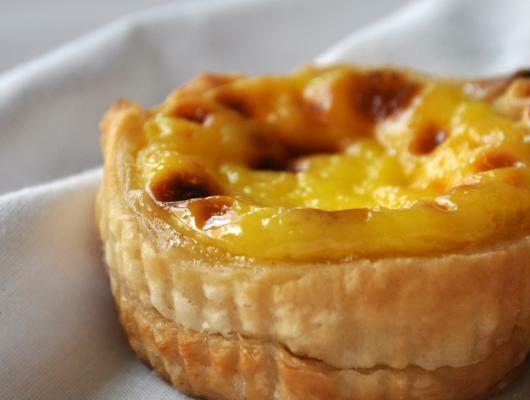 If you insert a toothpick into the center of the custards it should come out clean.